This is getting very exciting. We are going to take you on a tour of the Mediterranean in a clockwise direction, based on Egret’s return to the Med in 2011, as well as supplementing earlier destinations we missed on the return. We have so much to share. I promise by the time we are finished with your inspirational Mediterranean cruise, you may well be planning your own cruise, which is of course our goal. Cruising the Mediterranean is an attainable goal for almost anyone if they work at it and make it happen. Best of all, you don’t have to be rich. If you have the desire you will see first hand everything and more you will be privy to here over the coming months. The boat you choose, power or sail, almost doesn’t matter as long as it is dependable and you are comfortable with maintaining it yourself, even if you are budget challenged, so to speak. Egret anchored in anchorages in some of the most incredible destinations in the world alongside modest sailboats with a budget of a few hundred dollars a month and they saw everything we saw. They had the desire and made it happen. It is nice to have a more comfortable boat, but it isn’t the end all. OK, we’ll move along after this modest rant with an issue close to our hearts. Photography. We found a common dominator among cruisers in Egret’s travels. Even the people on the most basic boats had a ‘big’ camera on board. Cruisers are so privileged and enjoy such interesting destinations; we as a group want to preserve those memories. When it comes right down to it, when we ultimately wash ashore, all we are left with are our memories. Photographs record those memories in detail rather than believing you will remember events that in reality, fade rather quickly. Even today, after all these years, when we see a photograph it takes us right back. Photographs are how I am writing what you are reading today and in the future. Anyhow, you get the picture. Egret had an easy 8-day run from Grand Canaria in the Canary Islands to Gibraltar at the entrance to the Mediterranean, where we were lucky enough to get into the new marina with floating docks. Because of that we decided to spend a few days and play tourist. Gib has a great English grocery store so we loaded up with everything before heading into the Med. Mary and I decided to run a few days directly to one of our favorite anchorages of Andratx on the island of Mallorca. Mallorca is the largest of four Balearic islands off the coast of Spain, and is the best destination to ship from the U.S. East Coast and return. On the way, passing the Balearic Island of Ibiza, we had a serious issue with a ferry running 22 knots at 0100 in the morning. Mary was on watch and shortly both of us were in the pilothouse trying to make sense of the AIS CPA (Closest Point of Approach) that at the time was 00 meaning there was ZERO distance between Egret’s and the ^&%###$%* ferry’s course. Not only that, the ferry was so illuminated the running lights were indistinguishable. Rather than go on, let’s just say it was a close call and a testament to the value of AIS. 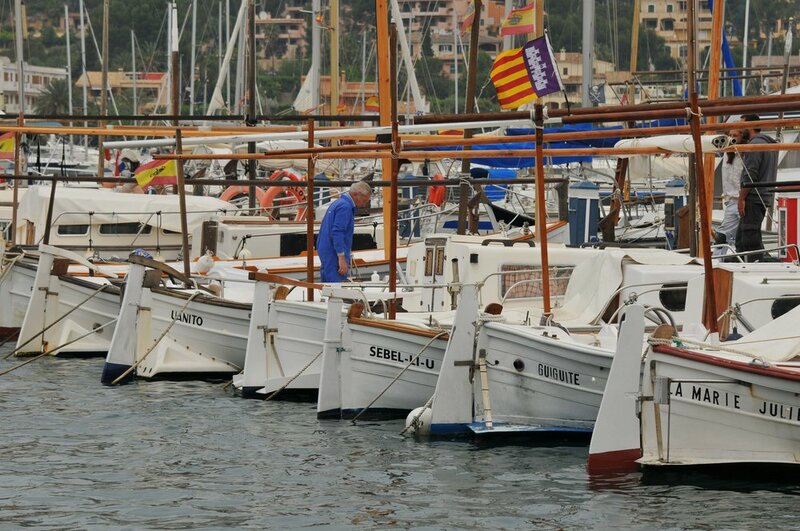 Egret arrived at Andratx in the morning and wandered the harbor looking for a place to anchor. The inner harbor was full of moorings so it took a while looking in deeper water and ultimately down went TK, Egret’s bad boy anchor in 42 feet of water. Later before dark the captain of a large sailboat on a mooring behind us offered us his owner’s private mooring for a week if we wished. Well, ok then. Up came TK and soon Mary had Egret on the mooring. One of our favorite memories of Anthrax* was a shore-side restaurant that served light-as-a-cloud pastries sprinkled with powered sugar along with a café’ con leche’. Oh yea baby, was life good or what, after a multi-day trek from Gibraltar? *Mary and I occasionally re-name places or things; in this case Andratx became Anthrax. Typically, after morning coffee we would wander the town for a few hours, return to Egret for lunch and a more than occasional nap, then return to town in the afternoon. This is what Med cruising is all about, relaxing and enjoying areas seething with history, culture and tradition. Of course, our walks usually begin with a tour of the waterfront. Even after a working life in the boat business, I still can’t get enough and Mary is right there with me. Each area of the Mediterranean has localized boats that change shape and design around the Mediterranean rim. Each local area borrows from the bordering area. In Mallorca’s case, the high stem and tapered stern denote the design. When we get around to Malta, the Maltese take the stem to an extreme but you’ll have to wait to see that. We’re in no hurry and in time you will see it all. One thing nice about the Med is commercial fishing boats still have their place in the inner harbor where waterfront space is quite valuable. Small boats like in the first photograph deploy and retrieve their nets over the bow. Small boats typically target bottom fish. All fishing boats are heavily regulated to so many meters of nets, size of nets, and so on. The bottom fishing nets have a lead core along the bottom of the nets with floats at the top. Larger fishing boats like in the second photograph set and retrieve nets off the stern targeting pelagic school fish like sardines. Commercial fishing is a difficult task in the Med. Even back during Roman times, fishermen complained of no fish. I got to see that first hand when I was stationed in Izmir, Turkey a few centuries ago. I belonged to a dive club and even when diving with tanks I saw exactly one fish larger than 2 pounds during a summer diving around underwater rocks and caves. For years there was a yellowfin tuna fishery, a three-week phenomenon occurring each summer in the area south of Sicily toward Malta. The Italians would place nets far out to sea in shallow water held in place by poles. The net design was maze-like and ultimately led the tuna into a kill corral where fishermen in boats would simply hand gaff the tuna from an ever-decreasing circle of nets. That fishery has been over for years now. One highlight of every anchorage is dinghy exploring. In Anthrax’s case, it was the beautiful harbor-side homes that were the most interesting. *What did you do today is cruel, particularly if you are still in work mode (gasp), however we’re just trying to focus your thoughts. So we walked the streets for a few days, recording everyday events like weekend bicyclers and vacationing strollers. 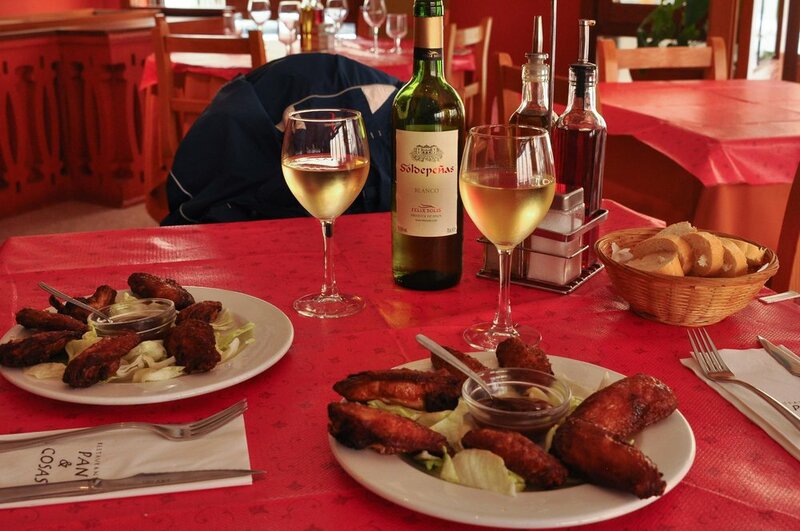 We celebrated our last day lunching with locals on an obscure side street. Here’s a small tip. One thing that is nearly universal in all Mediterranean harbor towns: If you get lost, walk downhill until you see water. We’ll leave you with two photographs, the first taken at night from the pilothouse and the second from the cockpit. Incidentally, here’s something else to think about as we share our journey. Print yourself a copy of a map of the Med and follow along so countries, islands, towns, and anchorages become more than words, particularly if your high school geography isn’t any better than ours was when we began looking at the Mediterranean. Hummm, let’s see…can you easily point out Corsica, Elba, Sardinia, and Malta? Coz we’re going there. Peloponnese Peninsula, Crete, and Sicily? Eh? The next posting from our favorite anchorage in Mallorca is so way bad cool we’ll make it a two-part posting coz we don’t want to miss a thing. Have you subscribed to FollowingSeas yet?